On April 25, the skywalk was opened to public. Rajdeep Buildcon Private Company invested Rs 2.25 crore to build the skywalk along with two lifts. These lifts were installed to help elders, physically challenged and others who are unable to climb the staircase. The company’s management claims that nearly 600 to 800 people use the lift facility from 9.30 to 11.30 am and 4.30 to 6.30 pm. BBMP has deployed two operators throughout the day to ensure the safety of the users. “We have invested a huge amount on this project with a motto to serve people. But many pedestrians do not use it,” said H S Harish, Assistant manager of Rajdeep Buildcon Private Company.But for some pedestrians, it has come as a relief. I wonder what the PPP terms are, and how the operation can be sustainable. And, when it is supposed to be a PPP, why is BBMP deploying two operators? 2. Outer Ring Road between Silkboard and Hebbal where signal free roads are proposed without even thinking of how pedestrains would cross the road. I am wondering how ORRCA has kept mum without any concerns of their employees. ORRCA can build up in PPP model in co-ordination with BDA since ORR is built and maintained by BDA. 3. Koramangala Inner Ring Road in front of EGCL where hundreds of people cross the road after getting down the city bus. 4. Corporation Circle probably in a Circular fashion enabling easy changeover of buses for Pedestrains . 5. Various places along Airport Road. 6. In Bangalore Railway Station, Footover Bridge within the station should be connected to that of Majestic BMTC Bus Stand to eliminate multiple "climb up", "get down" to reach Majestic Bus Station. BDA and BBMP before thinking of signal free corridors should think of Pedestrain crossings.. I would any day prefer the Mumbai type sky-walks than these cost-ineffective pursuits of the BBMP. A list of a hundred odd sky-walks coming up across the city is attached to the original post. Frankly, I am not quite in favour of them, for reasons already stated. My option would be for the Mumbai type sky-walks (check the post above), particularly at fly-over junctions and high pedestrian density corridors. Bangaloreans are hardly using the skywalks built to cross the roads. However, the Bruhat Bangalore Mahanagara Palike (BBMP) is going ahead with its plans to construct 120 skywalks under private public partnership (PPP) model. - - - “Each flyover will be constructed at a cost of Rs 2 crore. We will not spend a single rupee on this project. In fact, BBMP will earn Rs 5 lakh per year from rent and also advertisement tax from private companies,” he said. Private companies are allowed to put hoardings on the bridge, he added. Meanwhile, urban planning expert V Ravichander has questioned the need to build so many skywalks as people are hardly using the seven existing skywalks. “There is no need for 120 skywalks that too when the existing ones are under utilised. Pedestrians should be given prominence. They should be provided with a safe surface level facility to cross roads,” he said. “Skywalks should not be constructed for the sake of advertisements and hoardings,” Ravichander observed. Again, a largely revenue-oriented pursuit (check here for more on that), in the name of the pedestrian, that will besides add to uglification of the city resulting from the ads. More than providing any value, these will only inconvenience the pedestrian even more. And, just see above for the kind of innovative solutions that cities, which have genuine considerations for the pedestrians, provide. One really hopes there is a re-think on this mis-adventure. I agree with Ravichander. Has any data been collected on the utilisation of existing skywalks by pedestrians in Bangalore. And what is the data on the number of jaywalking even at the places where skywalks have been provided? Is the government getting into commercial deals or should it be concentrating on providing better governnace and better delivery system? Has there been any study/assessment done on wether population preferred to use skywalks. Are they more conscious of and educated about road sense and safety? Have they developed a better sense of civic responsibilities and behaviour? Further and esssentially, if the people responsible for planning city's development were more conscious that the healthy growth of city depends not on what appears great on paper or how much money is spent but upon providing appropriate insfrastructure for city dwellers on the ground, at the level where the target section understands and accepts it. If they only cater to builders, traders and automobile lobbies to safeguard their interests, and at the same time do not understand that for any project to succeed, it must be user friendly, Bangalore will continue to multiply its woes. Till then you will see chaos on the roads because virtually every street has become commercial, and people will need to cross roads. Among pedestrians will be elderly, differently abled and children and women. There will be several who are just not comfortable using mechanical medium. Providing 'lifts' is a fancy idea in our conditions. First of all there are those who are petrified of elevators. What happens when it develops a defect? What happens when power failure happens without notice? There will also be those who come from rural areas with little understanding of city life. And most importantly, our system which can not prevent stray cattle and dogs from roaming on the streets, from where will the authorities suddenly find the will and means to control pedestrians from crossing roads at their will? Let us get our priorities right. First understand right, then plan right, then educate right then provide appropriate infrastructure (including uninterrupted 24x365 days power) and then think of fancy projects. Better to provide more flyovers and underpasses for vehicular traffic, better mass transport and connectivity, restricted/no use of individual motorised transport (including two wheelers) particularly in areas where skywalks are proposed, better pavements. An alternative should be found not for the pedesrtians, but for those who use individual mechanical transport to clog our roads and endanger pedestrians' lives. Broadly, no vehicular traffic should be allowed on streets that have become commercial. And lastly, NO DISCRETION OR EXCEPTIONS. Given a choice, I don’t think anyone anywhere in the world would prefer to use skywalks or pedestrian subways when cross-overs across streets on surface are also left wide open, inviting pedestrians to cross on the surface rather than climb up or down. Skywalks are grossly under-utilized in Bangalore, no doubt, but this does not mean that the city does not need them at all – the city is in no way different than others. Similar to cities abroad, BBMP must barricade sidewalks & increase the height of median dividers on streets to ensure people use them rather than just build these skywalks & adopt a laissez-faire attitude as to what happens after constructing them. An example is the pedestrian subway at city railway station – since the road has been cordoned off, all people use the subway for crossing over without any qualms & without exception, whereas almost everywhere else, we see people ignoring them – only because roads have not sufficiently been barricaded & cordoned off. Skywalks only serve their purpose when the total crossing distance is 6 lanes or more because with a 20 sec ped phase 4 lanes of traffic can be crossed. More than 20 seconds will need the ped phase to be broken up with a traffic island, except the wait time in the island will be equal to atleast 2 signal pahses of traffic. If you notice the japanese circular skywalk picture above it has its vestibule going into the building on 2 sides instead of on to the sidewalk. The Pudong circular skywalk covers a large area so is more efficient. Compare with the skywalks we have put up in Bangalore. It takes more time going up & down than crossing on the surface. For maximum pedestrian efficiency dont put up skywalks or subways on 4 lane roads or less (which is most of Bangalore city. 6 lane roads with signals will need a ped island in the median so as to make the surface crossing easier. So you will notice most of Bangalore dont need skywalks except on the highways. By this reasoning, most world cities do not need skywalks on most of their roads since 6-lane roads are not common everywhere in most cities. Below are images of skywalks in Singapore - on roads with 4 lanes (excluding bus bays, if any). Majority of skywalks in Singapore are across 4-lane roads. 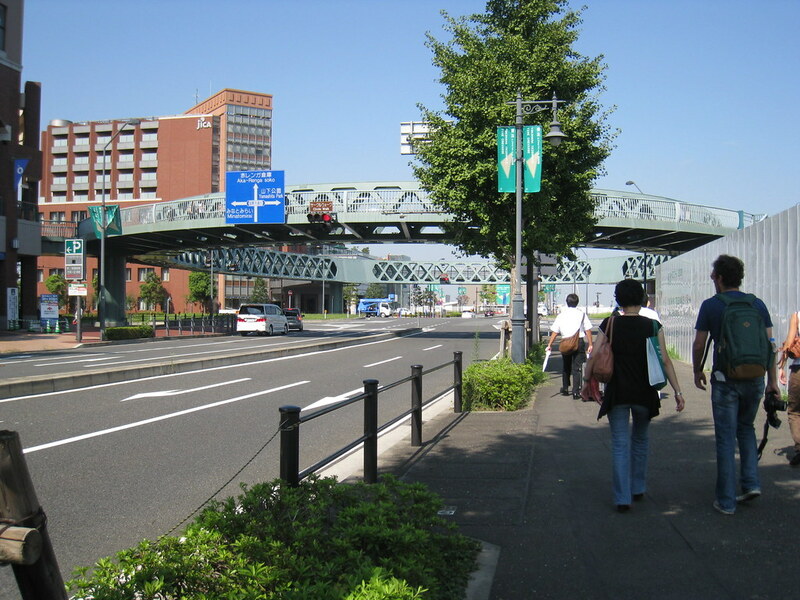 There are similar skywalks in Hong Kong & Japan that I have seen, even across smaller 2-lane roads (in Island city, Ginza, Tokyo, Kobe, Osaka, etc), but I am unable to find images on the net. Notice the barricades on each side - this is what determines how much it actually gets used by pedestrians. Suffice to say that there are no rules or standards for road widths as to where they fit or do not - it is dependent on needs & traffic - & Bangalore's pedestrian traffic is high & growing & is set to increase even further once the Metro becomes operational. I have used those skywalks in singapore they have been around for long & they are an overkill. I am surprised Sg hasnt torn them down already. I have often wondered why they didnt put a surface ped crossing in those locations. I can show you similar situations in europe where they have given the skywalks the go by & it has worked fine. I found the elevated crossways across the expressways very useful. For example the bus bays on the AYE near science park are on an elevated slip road & the crossway was used extensively to get across the expressway. They may seem like an overkill in most parts of Singapore & old European cities may have dismantled some of them (relatively lighter pedestrian loads & more disciplined traffic), but they certainly would be far more useful in Indian cities, like in old city areas in Hong Kong, Taiwan, Japan & elsewhere with narrow streets & very high pedestrian /road traffic. If such skywalks are built with escalators & lifts, they could be a boon for the city. BBMP will have to address issues such as barricading sidewalks /medians to prevent jay walking, ensuring availability of continuous /uninterrupted power + long-term maintenance - these would be the challenges. I belive sky walk is must in most part of the city where the traffic density vechicle movement & road width is high especially like ORR near EGCL , ST johns hospital,crist college Nr Dairy circle, Madival Total Mall. Forum, But Barricade on pavements has to incresed in order to people to make use of these skywalk people always finds easy way out by negllecting the danger on road. Its time For BBMP to think of Bus bay like Gujarath Model in Ring roads. so that there would be smoth moving of vechicles since the road r wide enough to plan such bay . Most of the fly over in Bangalore r un planned i belive Dairy circle & Hebbal is the best as far as i noticed . Silk board signal required a dairy circle model like over bridge n under pass . In future plan i belive engineers will follow that model where four Roads meet. In major Roads the crossings should be avoided so that there would signal atleast for a kilometer or Half a kilometer to avoid congestion In 100ft road therre is lot of crossing n vechicle movement most part of the day is congested . even near domlur bridge a U turn should be planned under the fly over for buses n small vechicles which move towards Domlur so that signal is avoided over there, block median till bridge & divert the traffic so that there would be free movement. Near Egcl Gate Bus stop should be avoided near the main gate even though bus stops near Dell people wait near EGCL gate its sad we R health concious Bangaloreans Dont want to walk even a half a kM for Bus & Block Roads in Between n speak about traffic :(. i noticed lot of Bus stops are near signal junction which should be moved atlest 150 mts away frm junction to avoid snarls. Skywalks are an exception to be used where pedestrians will benefit from using them. Walk along the route & time the total crossing duration & difficulty level for all classes of pedestrians. You will then be in a position to decide what is useful. Skywalks have become an instrument on how to avoid people interrupting the vehicles regardless of how difficult/time waste it is for people to use them on small roads. A pedestrian comes to a skywalk, s/he climbs 30 feet and crosses the road which takes at least 3 minutes. He has he got safety, and he reached just across the road. Now a car traveling at 60 kmph will be 3 km away in 3 minutes. Pedestrian dont want skywalks just for the sake of safety. Anyway to maintain 60 kmph you need to have flyovers at all junctions, so instead of sky walks make flyovers and toll it. At the Traffic Advisory Committee (TAC) meeting held on the 16th, while on the subject of sky-walks, Mr Kabade, the BBMP official, stated that the tender for the 120 odd skywalks, modelled on the one operational at the Mysore Bank junction, did not receive much of a response, consequent to which, they are now going to be revising the terms slightly and re-issuing the tenders. A few weeks back, I had occasioned to visit the Kandaya Bhavana (check this), that has come up in the premises adjacent to the Mysore Bank junction sky-walk. Now, the main source of revenue for the sky-walk PPP contractor is through ads on walk-way wall facing the traffic flow, and in order to maximise this area, he has built it up almost to the full height, cutting off whatever little day-light that could creep in onto the walk-way even. The revenue generation having to cover the installation and running costs of the entire paraphernalia, comprising the structure, two lifts, salaries for the operators, power charges, BBMP's charges (apart from bribes), etc, the ad space charge becomes too high for any advertiser to want to contract for it, and consequently, it was not surprising to find the contractor's contact particulars painted on the space, soliciting custom. Besides, the few minutes that I was moving in the vicinity, I don't recall noticing any person using the sky-walk (unless they were well hidden behind the tall walk-way walls), whereas there were enough people 'jay-walking' across the road, even though it can be extremely dangerous at this point. Actually, I wouldn't blame the jay-walkers, since, if they were to use the lifts to go up to the walk-way, it would take a minimum of 3 minutes to cross the junction (that is if they don't have to wait in a queue), as compared to the 5 seconds it will take anyone (except the infirm) to trot across. Very clearly, everything is wrong about this whole approach, supposedly being pursued with a view to earning a few crores into the revenue kitty, but which, instead of facilitating pedestrian movement, is just adding to pedestrian woes (check my post of the 15th Oct, above). Such revenue-oriented approaches are not limited to BBMP's schemes/ projects alone, but spread right across most government organisations and their respective schemes/ projects (check here for more). Actually, however, if one were to analyse these thoroughly, it will become quite evident that the main attractions in these are the various contracts involved (and kick-backs thereof), that go on behind the revenue-orientation curtain. With the government's serious capacity limitations, awareness has generally built-up over the years on the need for it to outsource/ privatise all none-core functions. In such a scenario, the PPP mode becomes a very useful tool if used judiciously. But, of course, they can very easily converted to tools for pursuing various individual/ coterie agenda's too, if they are gone about in a non-transparent manner. Instead of demanding that kind of a transparency, some sections of Civil Society are unfortunately demanding reverting to the age-old ways, even if they do not meet present day needs, ending up essentially with the baby going out with the bath-water. I am now going to be suggesting to the TAC to recommend scrapping of the tender, getting the entire scheme re-looked at by CiSTUP, before proceeding on the matter any further. The city has waited long enough, and a few more months of wait cannot harm it as much as the absolutely useless, and on top of it ugly (with the clutter of the ads) contraptions would, if they are to come up all across the city. I expect I have the support of Prajagalu. On a comparison, there are kilometers of sky-walks all across Mumbai (with ads on them only at the main road crossings), which are serving a very useful purpose, as has shown up through a survey, acessible here. Next we have to take up the so-called Bus Shelters where no buses stop, but only encroaching and blocking the narrow footpaths just for advt. hoardings and earning money (legal & illegal). Praja did quite a lot of research on the pedestrain crossover on OMR near the begining of the cable stayed bridge..and eventually a skywalk was provided there and I was pleased to see it last week being fully utilized even duing afternoon period.. So its more I think to do with the traffic conditions below that will decide pedestrain behaviour! On KG road, the traffic stops at the lights and this gives ppl a chance to cross road at grade. This is unlike the OMR junction where traffic flows continously and the elevated walk way is the only safe option! So what was needed in KG road was perhaps better ped crossing facilty at grade rather than the elevated contraption! Sky walks normally take care of longer stretches coverig more than one road crossings unlike foot over bridges and pedestrian subways both of which are mostly avoided by citizens. The only busy subway in Bangalore appears to be that connecting the Mejestic bus stand and the rly stn. Most others are at best shelters for beggers or uncivic activities. The numbers indicate that, what the plannaers are planning are simple foot over bridges and not sky walks. The new global thinking on this ,and especially in city centres,is that pedestrian facilties must be at grade,and vehicle bearing ways can be st different level. Though not easy to ,think of something like this on mg /brigade road or even on some areas on koramangala. The pedestrian area then does not become just a walkway but a true area for human interaction. @ Srinidhi - Yes, the foot-over-bridge at Krishnarajapuram certainly seems to serve a useful purpose. If the BBMP executes similar projects, they would be welcome. But, unfortunately, BBMP's concentration is on revenue maximisation (or, at least, that's what it is made out to be), and that's when they come up with useless contraptions like the one you have at the Mysore Bank junction. And, that's why I am suggesting that an expert set up like CiSTUP be asked to specify the kind of foot-over-bridges/ sub-ways/ sky-walks that should come up in each of the locations. The Krishnarajapuram location, if you ask me, would have been an ideal one for a sky-walk, covering the station, and other points too. Addl. CP, Traffic stated that to minimize pedestrian deaths, pedestrian facilities should be provided to the pedestrians on the streets. BBMP is instructed to restore footpath and skywalks. Sri. Basavaraj Kabade, Executive Engineer, BBMP, TEC, Bangalore stated that BBMP has not received any single bid for construction of 100 Skywalks in Bangalore City. BBMP will retender the construction works of Skywalks. Some members of committee suggested to change the locations of the Skywalks, as many of the skywalks are not at the right spot. Locations of skywalks may be identified by BBMP where it is more advantageous to pedestrians than presently identified places. Prof. T.G. Sitharam Stated that, study on the use of Underpasses in Bangalore City has been completed. In the same way, a study may be conducted to identify the locations of skywalks in Bangalore City which will definitely help pedestrians. Some members of the committee suggested that Skywalk constructed at Marathalli is more than specified height. Due to this, majority of pedestrians are not using the Skywalk. Many of the pedestrians lost their lives due to not using of Skywalk in this junction. CP, Bangalore City stated that Civic agencies should plan all pedestrian related works and complete accordingly. Sir, Taking into view what is recorded with reference to "Sky-walks", can we as a body request the Commissioner, BBMP, to have the current tender specs reviewed totally by CiSTUP, before re-tendering. First and foremost, as stated in this comment (my post of 15th Oct, above, as well as many others), the BBMP should be asked to give up its revenue-oriented thinking while planning such infrastructure projects, which is the factor causing the sky-walks to become useless eye-sores. Why is there so much clamour for sky-walks? And why the need to paint sky-walks as the "panacea" to pedestrian problems? Pedestrians should be provided crossing facilities at-grade. This has to be non-negotiable. The whole policy of making people climb up steps so that vehicles don't have to stop/slow down isn't right. Just curious, how exactly does one attend these meetings? Is it open to the public? @ SridharRaman - Even if one wants to wish away cars, there are still the buses and public utility vehicles that have to move around, and at more than bullock-cart speeds. As such, while you can have at-grade pedestrian crossings in CBD's, and largely residential areas, along arterial roads, it may not always be practical to provide for them, and that's where well designed foot over-bridges/ sub-ways/ sky-walks etc could come in. in order to maximise this area, he has built it up almost to the full height, cutting off whatever little day-light that could creep in onto the walk-way even. The revenue generation having to cover the installation and running costs of the entire paraphernalia, comprising the structure, two lifts, salaries for the operators, power charges, BBMP's charges (apart from bribes), etc, the ad space charge becomes too high for any advertiser to want to contract for it, and consequently, it was not surprising to find the contractor's contact particulars painted on the space, soliciting custom. The picture below, taken about a week back, tells the story in totality. Subway connecting SBC to KBS is the most horrible in Bangalore. If a similar one is constructed connecting SBC Footover bridge with KBS footover bridge, it would be very convenient for people instead of climbing and getting down multiple times especially for aged and people carrying huge luggage. Murali You have clearly spelt out the process in your letter to BBMP Commissioner / Addl Com Traffic for future planning and execution of these projects. After Elections are over I feel we should take up this issue more seriously. 4. A co-ordination Committee of all the Stake holders ( CIVIC AGENCIES) should be part of this process, which should give neceesary clearances well before these project works begin.Very often they do not complete their part of the work such as lines shiftiong etc , which hampers the work process. The foot-overbridge erected by the BBMP, near the Christ College, is admittedly a competent job. But, having decided to go in for lifts, which then means adding a genset (given the erratic power supply scenario - see the room circled in red in the picture), all of that entailing operation & maintenance, and consequently huge installation and running costs, the BBMP is looking for PPP contractors to take them up on long lease, the revenue to come through sale of ad space along the walk-way sides (the strip marked by red arrow in the licture, lit up at nights - see the lamps circled in red). What has happened in the process is the entire matter has got complicated, and, with not enough contractors coming forward to take them up, the jobs have got stalled. Also, considering the fact that it'll take a minimum of 3 minutes if you want to cross the road using the lifts, I doubt the usage will be high, which will eventually lead to the contractor not maintaining it (if not quietly selling it off even). In addition, is going to be the uglification of the city landscape because of the ads, apart from the question of security, particularly for women, in the totally covered passage way. Given all of this, wouldn't it have been much simpler for the BBMP to instead provide wheel-chair ramps along one side of the steps, thereby reducing the installation cost considerably and almost eliminating maintenance costs, and then fund all of it by itself? Congestion charges, parking charges, etc for cars are understandable. But, shouldn't pedestrian infrastructure, a basic need of the citizen, be funded by the municipality itself? And, in order that the costs involved don't become too high and lead to budgetary constraints, wouldn't it have been better to keep them simple? Some interesting examples from across the world can be accessed by scrolling above to the post made by Naveen (a globe-trotter) on 15th Oct, '12. Besides, if kept simple, perhaps there'll even be enough Corporates coming forward to fund them, if the BBMP so desires, with just a simple plaque acknowledging their contribution, displayed on it not too inconspicuously. Would the BBMP like to think along these lines for the many more foot-overbridges that are planned across the city? All of that, does not take away from the fact that this is a job well done, as brought out in the pictures below, particularly compared to the likes of the one adjoining Sophia school (see the last picture, and comments here). BBMP deserves kudos for that. Road narrowed down by about 4ft width (and neatly marked) to allow for a 3ft passage for walk-through pedestrians. This is perhaps the best BBMP could do considering the transformer installation (circled in red) already encroaching onto the footpath. The foot-overbridge near Sophia school, where the passage way is about 2ft (4 steps) higher than the mandated 5.5M (from the road surface), because of the support bracings (shown in red) being provided below the floor boards. Besides, the steps have almost totally blocked off the way for the walk-through pedestrians. Pedestrians will continue to risk life and limb at the city’s busy junctions as no contractors are coming forward to build skywalks. After a feasibility study in 2012, the BBMP announced plans for 100 skywalks across the city. Of them, 30 were built and are in use. On April 15, the BBMP called for tenders to build 56 more. The bidders were to design, build, finance, operate and transfer the skywalks with a concessionaire period of 20 years. The model is called DBFOT in official parlance. The locations included the Cantonment Railway Station (car park to station), ISKON temple, Rajajinagar, and Satellite Bus Stand, Mysore Road (bus stand to Ramani Timber Mark). “This is the seventh call. No one is responding. One reason is that the bidder has to take care of everything. Though we allow them to put up hoardings for 20 years, their returns are delayed,” a senior BBMP official said. - - - BBMP administrator T M Vijay Bhaskar said he would call a meeting soon. “We will ask why no one is coming forward. If required, we will make changes in the tender terms,” he said. The entire problem arises out of BBMP's revenue maximisation approach to solving simple problems, which approach complicates matters totally, as has been illustrated graphically in the Christ University example cited in my earlier post (scroll above). While revenue considerations could also come into the picture, in the case of regulation of motorised traffic (in the form of congestion charges, tolls, etc), its being granted primacy in the order of things, is when the solutions go totally wrong. Either way, a revenue-oriented approach to providing pedestrian facilities, is fundamentally wrong. The answer lies in making the solutions simple, whereby it will readily attract sponsors, failing which it can be funded by BBMP itself. As regards making the facility disabled, and senior-citizen friendly, a better option may lie in having "pelican crossings" (check here) at grade, for use exclusively by them (or police). One hopes the Administrator takes all of these into consideration, and solves the problem that has remained unsolved for years together, leading to many a fatality. How can anyone fill a buket with holes. Under such circumstances only leakage maximiztion is possible. The order (issued by the government in May) asked the BBMP to ensure that 24.1% of the private partners building skywalks belong to the SC ST category. Simply put, of the 54 skywalks planned, 13 should be built by SCST contractors. With the skywalk project, BBMP aims not only to safeguard pedestrians but also fill its coffers through advertisements. Both the Palike and the private partner concessionaire will rake in revenue through ads on these skywalks. - - - BBMP administrator TM Vijay Bhaskar told TOI: “There are three major changes to be made in the earlier proposal: have reservation for SCST contractors; increase the concession period; and install an escalator at every skywalk. We could have released the corrigendum to the tender, but nothing can be done now until the elections are over." Essentially, this project is turning out to be just in the interest of the revenue for the BBMP, orders for the contractors, and publicity mileage for the ruling party for garnering SC/ST support in the upcoming BBMP elections - all in the name of the hapless pedestrian. One had hoped that the administrator, with the kind of reputation he came in with, would be able to steer the project through in the right direction, keeping largely the interest of the key stake-holder, viz the pedestrian in view, as has been suggested in this blog. Alas, it's not to be. Perhaps, the following excerpts from another report in the ToI (for the full text, click here), points to the bureacrats' helplessness, however well-intentioned they may be. Sources said Krishna was shifted after he objected to IT-BT minister SR Patil's decision to hand over a project to a private company without inviting bids. The bureaucrat had also objected to the minister's missive to Keonics to buy pillows and blankets without a tender on behalf of the social welfare department, to be distributed among hostel kids. And, when the inevitable criticisms follow, the government then talks of setting up another vision group, as if the many that are there are not good enough. One had thought that Bengaluru, and Karnataka, deserved a lot better. I occasioned recently to cross the Fld Marshall Cariappa road in front of the Bangalore Club. Using the FoB, at the point, I realised why it was hardly used by the multitudes crossing the road even during peak traffic flow. One needed to climb an extra 5 steps (marked clearly in the picture) because of the poor design of providing the support webbings below the walk-way. This is quite the case with the FoB at Domlur exit on Indiranagar 100ft road, the one near Sophia school, etc, too. Fortunately, this anomaly has been corrected in the new ones erected near Christ College, and a few other places. But, here again, they went and complicated matters because of their "revenue maximisation approach" (read my post of 29th Apr,'15 - scrolling above), leading eventually to their having to abandon the ones proposed at Domlur junction, Dell bus-stop on IRR (after having undertaken the excavation work at these spots - presently covered behind corrugated sheets), with no contractors coming forward to even bid for them. Apparently, BBMP can learn only one lesson at a time. He said he had spoken to the guy in charge of maintaining the skywalk, and he was told the elevators were not operationalised to ensure people don’t misuse it. “From the third day, the elevators were stopped. They feel the cost and maintenance will go up if it is used,” he said. I had stated in my post of 20th Dec,'14 (scroll above to check) as "not enough contractors coming forward to take them up, the jobs have got stalled". BBMP's solution to that apparently was to make deals with "crony contractors" to fit just dummy elevators and gen-sets, thereby reducing their costs hugely, and then share the loot between themselves. 56 motorized sky walks for pedestrians! Right model from the left?